Bethlehem is located 7 km south of Jerusalem on a steep-sided ridge on the western mountains of the Dead Sea depression; its altitude is circa700 meters above sea level. It is surrounded on all sides, except westward, by deep valleys. The city of Bethlehem is holy to Christians as well as to Muslims. It is acknowledged worldwide as the birthplace of Jesus Christ, the Son of God in Christian belief and the divinely inspired prophet Issa to Muslims. 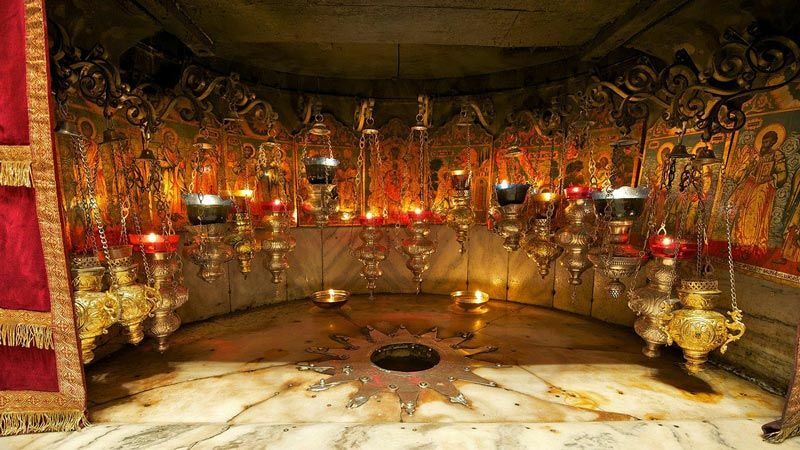 The Church of the Nativity, a Byzantine basilica, intended by Helena, mother of Emperor Constantine, to commemorate the event, was first dedicated on 339 AD, and is built on top of the cave where, according to a tradition first documented in the 2nd century AD, Jesus was born. The city itself has a long pre-Roman history documented first in the 14th century BC (Amarna letter n. 290: ‘But now even a town of the land of Jerusalem, Bit-Lahmi by name, a town belonging to the King …’). Archaeological evidence from the Chalcolithic period and Bronze and Iron Ages shows that the earliest settlement area was onthe eastern slope and in the middle of the fields of Beit Sahour, and it was probably here that the Iron Age city lay; but by the 10th-8th centuries BC, the town was on the high ridge of Bethlehem itself in the area of gardens around and east of the Nativity Church. The Caves beneath the Church were then in use. By 700 BC, the town lost some of its significance but it was an important centre once more during the Hellenistic and Roman periods. With the construction of the Jerusalem aqueduct, part of its water was diverted to the city. Jesus’ birth in Bethlehem at the end of Herod’s reign determined the destiny of the town. Under Constantine, the first Christian emperor, the Church of the Nativity was built as one of three imperial churches in Palestine. At the end of the 4th century AD, St. Jerome settled in Bethlehem and built two monasteries. The Church was destroyed in 529 AD and was rebuilt on a much grander scale under Justinian. Essentially that is the church which stands today. The city was depicted on the Madaba mosaic map in the 6th century AD. The Church forms the central feature of the town and is surrounded by other important sites related to the Nativity. Among these is the Milk Grotto, an irregular cave hewn in the soft limestone, located southeast of the Basilica, where according to Christian traditions, Mother Mary nursed baby Jesus while hiding there from Herod’s soldiers before going to Egypt. In the “Shepherds’ Fields” are two competing sites roughly 2 km east of Bethlehem: one belongs to the Roman Catholics, the other to the Greek Orthodox Church. Both claim the honour to be the location where the angel of the Lord appeared before the shepherds bringing them the good tidings of the birth of Jesus; acknowledging that the tradition is associated with this general area. The dense occupation west of the Church of Nativity indicates the main location of the Byzantine and medieval town. The urban fabric of Bethlehem today, with its old buildings, represents a significant example of vernacular urban ensemble. The old town is the main place were a wide range of religious and traditional activities takes place. The Patriarch route, which runs through Star Street in the old town, is the route where the religious parade passes each year in Christmas celebrations. Today Bethlehem still witnesses an annual special event, when people from all over the world attend the traditional celebration of Christmas.